John Fitzpatrick autobiography coming soon - Autosports Marketing Associates, Ltd.
BUTLER, Md. (March 4, 2016) – The long-anticipated autobiography of John Fitzpatrick, one of auto racing’s most successful and highly-respected drivers, is in the works and is expected to launch in the fall of 2016. Fitz – My Life at the Wheel will be published by Autosports Marketing Associates, Ltd., based in Butler, Md. Owned by another auto racing veteran, Michael Keyser, Autosports Marketing has published a number of popular books on the world’s iconic race-car drivers, race tracks and industry leaders. This will mark Keyser’s 13th volume of work chronicling the exciting history of motorsports, both in the United States and Europe. In the first chapter, Fitz takes us back to his early years in Birmingham, England, where his father’s interest in cars sparked the same in the young Fitzpatrick. Before finding his way into race cars, he became an accomplished golfer, but, it was automobiles that intrigued him, as he took every opportunity to sneak out to drive the family Morris Minor on private land and beaches at age 16. The ensuing chapters capture his rise as a race-car driver in England and eventually the U.S., a career that spanned 22 years. He began that journey in 1962 when he was 18 years old, racing a BMC Mini Cooper. Not long after that, he joined the pro ranks in 1964, driving for the works Mini Cooper team, and advanced to race for Ford, BMW, Abarth, Porsche and Jaguar. Known as one of the best Porsche drivers of his era, he raced a Porsche 911S for the Porsche Kremer team in 1972, winning five of the nine races in the inaugural European GT Championship, en route to winning the title and the Porsche Cup. In 1974 he claimed the prestigious Cup for the second time after once again taking the championship. He competed in Porsche 935s in the IMSA Series, winning the 1980 GTX Championship and grabbing his third Porsche Cup. From 1981 to 1987 Fitzpatrick ran his own team with wins in IMSA, Can-Am and the World Sports Car Championship. It includes nearly 300 pages of photographs never before published, with 13 chapters of thrilling, yet heart-warming accounts of the life of a man with a purpose – to be the best. He now happily reflects back on those days, in retirement at his home in the south of Spain with wife Sandra, working to complete the final chapters of this book. 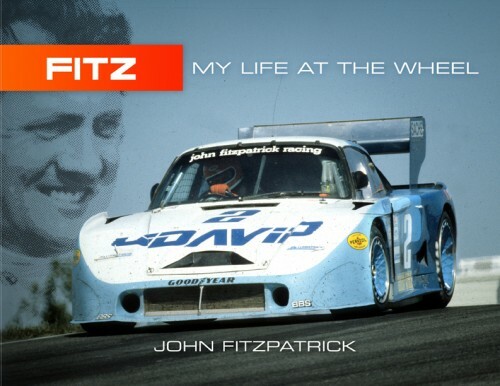 Fitz – My Life at the Wheel will be available at www.autosportsltd.com in the fall. Check the web site regularly to see its progress. An excerpt of the first chapter is available on the web site at: https://www.autosportsltd.com/wp-content/uploads/2016/02/Fitz-01-early-years-01.pdf. Attached is a digital image of the proposed cover for Fitz – My Life at the Wheel. In 1972 Michael finished third in the IMSA Camel GT Challenge series in a 2.5-liter Porsche, at the same time producing a documentary film, also called The Speed Merchants. Using his Porsche as a camera car, he raced at Daytona, Sebring, the Targa Florio, the Nûrburgring, Le Mans and Watkins Glen with German driver Jürgen Barth. He placed second in the Camel GT Challenge series in 1973, third in 1974 and eighth in 1975, driving a number of different Porsches. In 1976, after a victory in a Porsche at the 12 Hours of Sebring with Al Holbert, he switched to a Chevy Monza for the balance of the season, finishing fourth in the Camel GT series. In 1981, after driving for numerous teams, Keyser retired from active competition. The Speed Merchants was re-released in September of 1999 with a totally new text and twice as many photographs. A French Kiss With Death, a book about the making of Steve McQueen’s film Le Mans, by Michael Keyser, with Jonathan Williams, was released in November 1999. In 2007, Autosports Marketing published a two-volume set covering the colorful life of photo-journalist Bernard Cahier. F-Stops, Pit Stops, Laughter & Tears. The book contains many of Cahier’s most memorable photos along with personal anecdotes on the “behind the scenes” activities of some of motor racing’s great drivers from the ‘50s through the ‘80s. It was the winner of the 2007 Dean Batchelor Award For Excellence in Automotive Journalism. In 2010 the company published The Speed Merchants – Frame By Frame – The ’70s & ’80s, and in 2012 Evolution of the PORSCHE 911 In Competition – 1965-2010 and Behind Le Mans – The Film In Photographs. In 2015, Shooting Star On A Prancing Horse was published, written by Jonathan Williams.